Ahh the Atari 2600. Beautiful, majestic, and erm ancient? 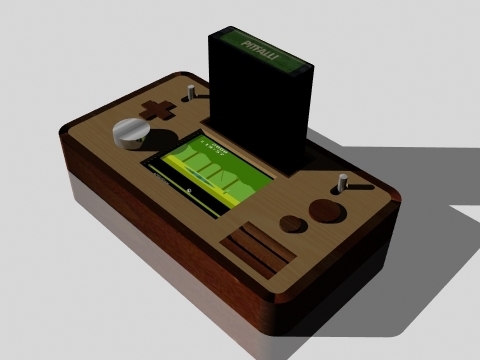 Codenamed “Stella”, it was one of the first home consoles to feature a CPU. 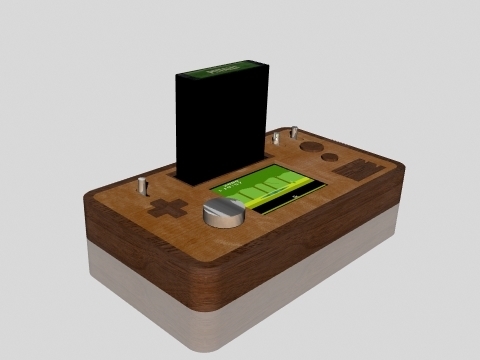 This enabled the 2600 to basically do anything the game programmer wanted it to do. Also, It was one of the first to feature a cartridge based system for games. 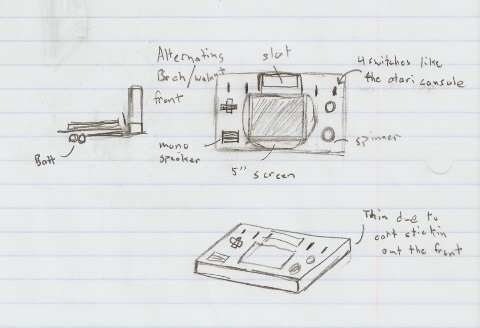 As always heres a sketch of the Atarip design I drew up. I decided to get a little fancy this time and do all the designing in Lightwave instead of using Sketch-up. Surprisingly It took roughly the same time to finish the design. 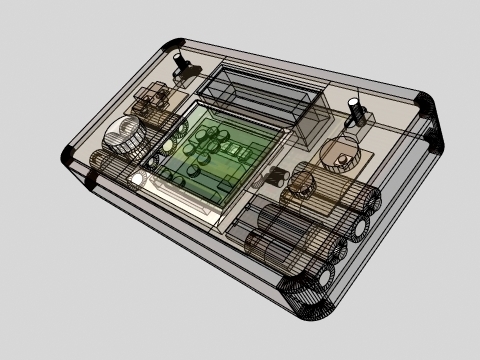 Also, Lightwave’s wireframe rendering looks much more professional than Sketch-up’s. This time around I decided to use a 3″ LCD instead of the usual 5″ PSone screen because it enabled me to shrink the size of the portable to about half of what my NESp is. The 8 AA batteries should give it a decent battery life to. There is going to be a built in paddle controller on the left side as well. 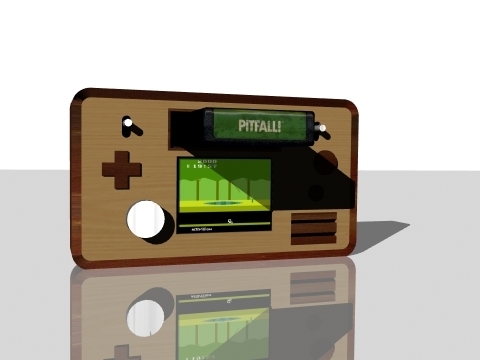 I tried to make this portable look as much like the original Atari 2600 as possible. Wood Grain and brushed-chrome switches are a key features to this design. 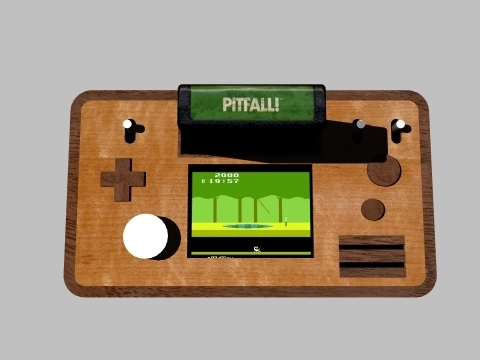 Drew up this Adobe Illustrator Layout of the case design for the Atari. The gird is set in 1/8″ increments so it is easier to hand make. 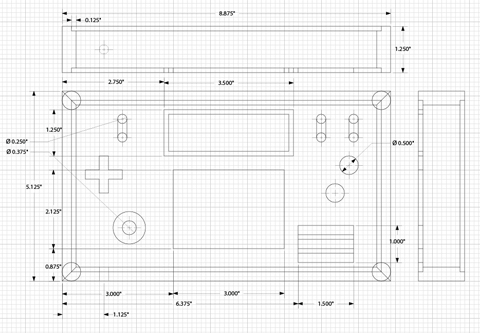 Plus I can print the design out in real size and test out the control layout before cutting. There is a slight design change from the Lightwave renders and the Layout. I added another switch so I can have the reset switch identical to the select switch. Updated the render of the case to include the extra switch. To be honest, I am kinda liking the crazy layout of this portable. Starting to look more like an old time radio of something along those lines. I also redid the wood textures like I did with the NESp V2. Here is a view of the portable like it you where actually playing it. The Cart does not get in the way and even acts like a sun visor keeping the glare off your screen (cough* design feature).